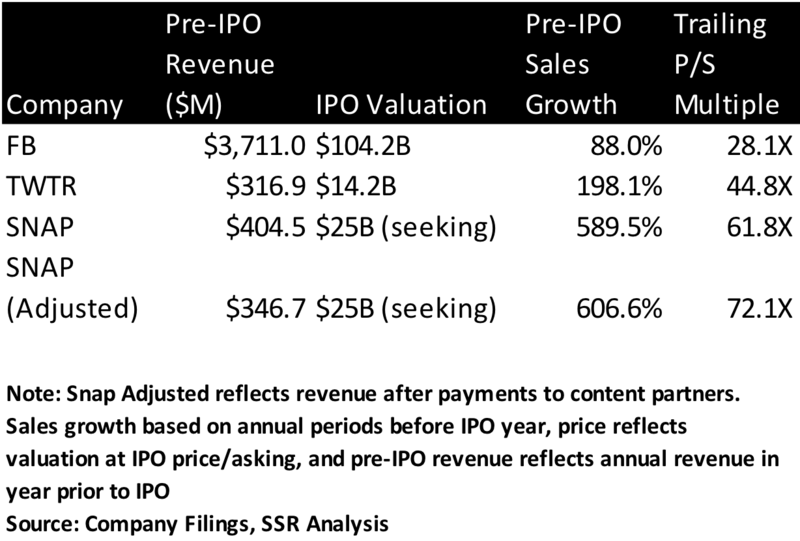 SNAP will have a hard time avoiding comparisons to TWTR as it approaches its IPO. On important metrics – user growth (decelerating), operating costs (very high and rising), and cash burn (twice revenues) – recent performance raises serious questions. The major bright spot – booming ad sales driving rapidly rising ARPUs – is at future risk to the decelerating user growth. TWTR is an object lesson for the lagged impact on advertiser enthusiasm. Against this skeptical narrative, SNAP management portrays itself not as a FB, GOOGL or AMZN, with first-to-scale moat to protect its use case and profitability from competition, but as an AAPL, able to use a self-proclaimed institutionalized innovation advantage to beat rivals to the punch and disrupt existing business models. This is a strategy that few companies, beyond AAPL during the epic 10-yr iPod/iPhone/iPad run, have ever made work. We are also concerned that the future true disruptions in SNAPs competitive arena will come from AI – e.g. virtual assistants, bots, augmented reality, sophisticated image/video processing, etc. – a field of technology where SNAP trails significant would-be rivals like FB, GOOGL, AMZN, and AAPL. With an expected IPO valuation of roughly $25B, SNAP would be trading at a significant P/S premium to either TWTR or FB post IPO with little prospect for near term profitability and questions about the sustainability of its growth. SNAP user growth is decelerating. At first glance, the 48% YoY growth in daily users posted for 4Q16 seems impressive. Still, that growth decelerated from 60+ in the two prior quarters. Moreover, with a strong bias toward younger demographics and bandwidth/platform requirements that shut out users in swaths of the emerging world, SNAP may be closer to saturation than it would seem at first. More than a third of US millennials are already daily users, with 30%+ of SNAP users claiming to use it specifically because their parents don’t. 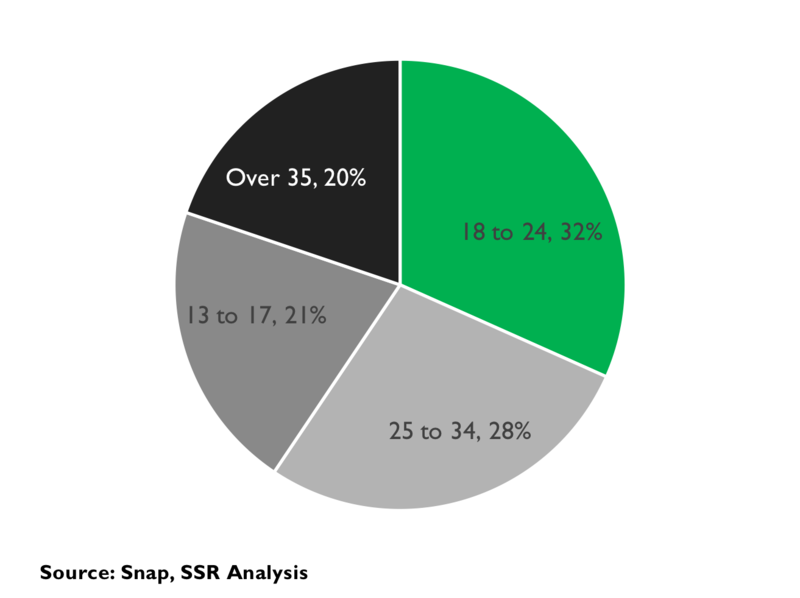 SNAP has 68M DAUs in North America, while the population between the ages of 14-34 is less than 100M. There is a bit more runway in the EU, but SNAP has made little progress in Asia against vigorous local alternatives. Unlike FB, SNAP seems to show no interest in breaking out of the well-off western millennial box. Can SNAP win on innovation? SNAP believes that the “first-to-scale, build a competitive moat” strategy that built the Internet behemoths GOOGL, AMZN and FB is no longer feasible. 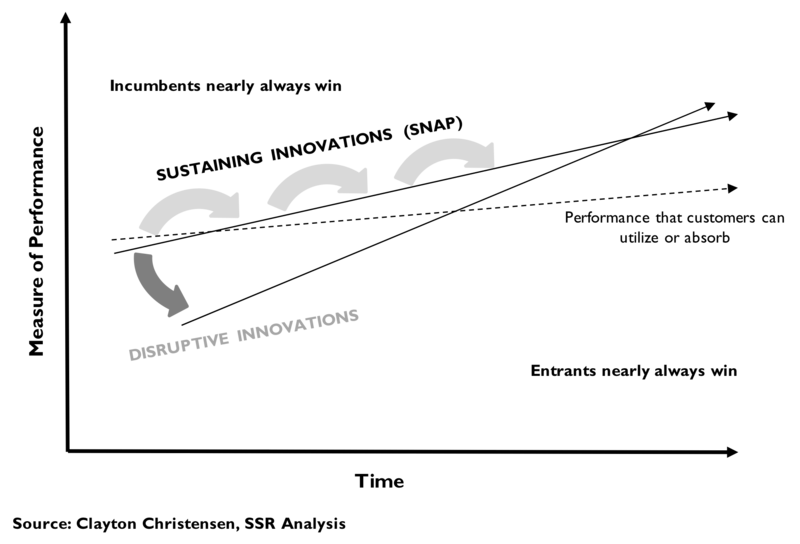 It believes that its sustainable competitive advantage is a unique institutional ability to innovate. It points to products like Stories, Lenses, and Spectacles and the strong growth in engagement – users now visit 18 times a day for 25 total minutes on average – as evidence. However, history suggests that innovation is often not enough, with the one-sided late 80’s Windows vs. Mac battle an object lesson. FB is a fast, capable and relentless follower with many competitive weapons at hand, and SNAP does not seem to be offering an iPhone-like disruption that could give it the high ground. We would greatly prefer a competitive moat. Booming ad sales driven by user growth story. SNAP’s ARPU more than trebled YoY for 4Q16 to $1.05 worldwide and $2.15 in N. America. This maps to TWTR’s $1.04 global ARPU (against MAUs, not DAUs) in the 4th quarter of its IPO year. Over the subsequent 12 quarters, TWTR’s ARPU doubled, despite its well-known struggles to attract new users. Similarly, SNAP can drive growth by increasing ad loads and shifting mix to higher revenue ad products (video, etc. ), with years of runway ahead of it. However, TWTR remains a cautionary tale – if the user/engagement growth narrative does not remain bullish, advertising demand, and thus ARPU, will flag. Outsourced infrastructure is not the major cost problem. SNAP has committed $3B over 5 yrs to GOOGL and AMZN for hosting. We believe this is smart – the partners give flexibility, service quality, access to AI-as-a-Service, and all-in cost advantages vs. building a private infrastructure. Still, SNAP’s video-processing heavy business is inherently costly to support vs. TWTR and FB’s more text focused interfaces. The 2016 unlevered free cash flow burn of $861M is 68% higher than revenues. Even outsourcing its infrastructure, SNAP’s CAPEX/Sales ratio of 13.4% is higher than the pre-IPO TWTR. SG&A, at 72% of sales, seems badly out of whack. SNAP may well grow into its hosting commitments; these other cost elements compare very badly to either FB or TWTR before their IPOs. Rumored pricing VERY expensive. Media reports suggest that SNAP will seek a valuation of ~25B on IPO shares structured to have almost no voting rights. While the 650% 2016 growth rate (off tiny 2015 sales) seems impressive, we are concerned that the pace going forward could cool quickly, for the reasons outlined above. 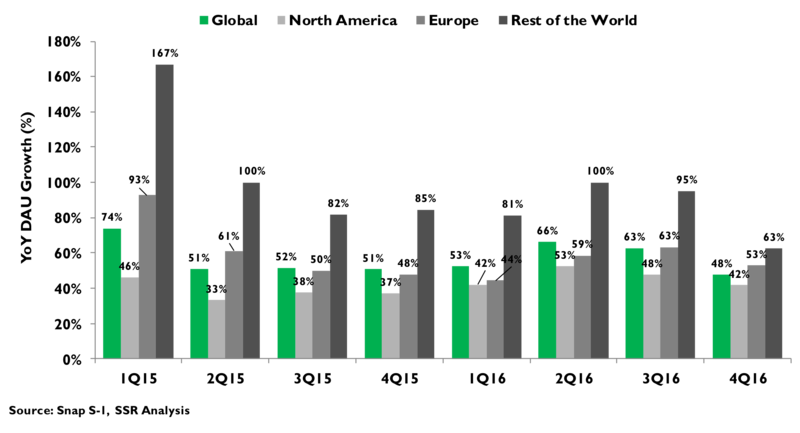 Moreover, it is not clear that even the current revenue trajectory would bring SNAP to profitability or cash positive operations for several quarters. Meanwhile, the rumored valuation P/S, at 75 time trailing revenues (excluding revenue shared with content partners), is more than double that of TWTR’s IPO. We do not expect an acquisition to bailout IPO investors – it is a very poor match for most of the companies with the resources to make a bid. A bet on Evan Spiegel. SNAP’s share class structure assures that co-founders Evan Spiegel and Bobby Murphy will retain voting control of the company no matter how much new equity they issue. CEO Spiegel must also make good on his assertion that SNAP can innovate quickly enough and well enough to stave off challenges from aggressive rivals, like FB, looking to take its users and engagement. Given the prodigious cash burn and the grandiose projected valuation, we are pessimistic for the future performance of SNAP shares and recommend a pass for the coming IPO. In its S-1, SNAP management suggests that the era of winner-take-all Internet franchises using scale to protect natural monopolies is over. It claims no lock-in holding its user base together – posts are ephemeral leaving no archive to care about and users have many other ways to share their thoughts and images. SNAP believes that it is popular – it has 158M DAUs skewed heavily toward young adult demographics in wealthy geographies – because it has introduced real innovation (e.g. ephemeral messages, photo stories, custom lenses, geography specific filters, spectacles, etc.) to the established fields of messaging and content sharing. Its future growth will be driven by its ability to keep up the pace of innovation and remain more compelling to users than the alternatives, primarily FB, which are quick to copy SNAP’s more successful introductions. In this way, SNAP is looking to emulate not FB, but AAPL, which has competed – and won – on product leadership even as its traditional moat of switching costs has eroded. AAPL is a hard act to follow. It delivered sea change disruption to 2 industries (i.e. recorded music, and cell phones) in less than a decade, established substantial competitive moats to start (i.e. iTunes, proprietary content formats, The App Store, etc.) then extended its dominance on sustaining innovation amidst a crowd of fast followers. 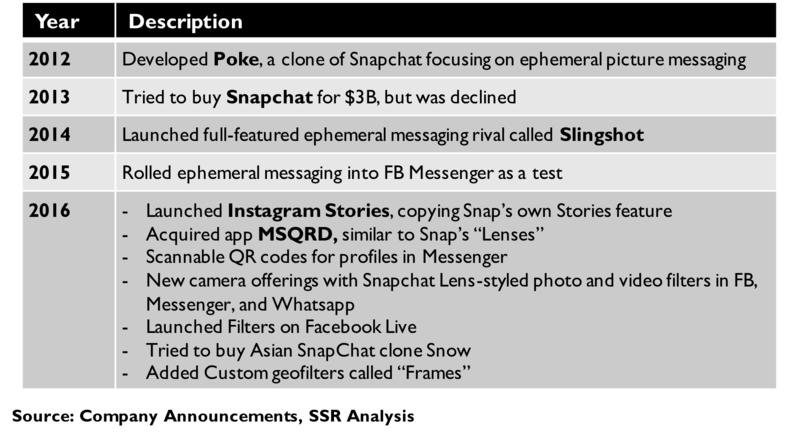 SNAP is looking to skip the first two steps – not just without a moat, but without paradigm shifting innovation either. Thus far, SNAP has been content to delight those young, wealthy consumers so desired by advertisers with clever tools to express themselves, in the process, becoming a much cooler alternative to the utilitarian FB. However, it is difficult to maintain that maximum cool status, and without that strategic moat and with rivals ready to copy every successful feature, SNAP has deliver a steady diet of new clever things better than the clever things delivered by others. This will be difficult. We think that the cleverest new things for the consumer mobile experience are bound to come from AI, a technology shift that greatly favors SNAP’s rivals for their collections of scarce talent and mountains of data. Highly personalized and predictive virtual assistants and augmented reality systems with sophisticated image processing could completely change the game and leave SNAP behind. This is a significant issue. Setting aside our concern for AI driven paradigm change, SNAP’s S-1 revealed other red flags. User growth is decelerating, while SNAP seems content to focus only on those young, wealthy users with high end smartphones and generous wireless broadband plans. Operating costs are extremely high compared to either FB or TWTR at their same stage of life. The cash burn – more than twice revenues – is huge, particularly given SNAP’s decision to outsource rather than build its infrastructure. Indeed, CAPEX, at 13.4% of sales, is higher than pre-IPO TWTR’s, despite that company’s substantial investment in its datacenters. The saving grace is ARPU, which grew threefold YoY in 2016 as advertisers chased those coveted users. Still, TWTR remains an uncomfortable object lesson – it too saw booming ARPU out of the IPO gate only to see its monetization erode as slowing user growth changed its narrative. SNAP’s IPO seeks a $25B valuation at 2.5 times the P/S of TWTR’s $14B IPO, with years of high double digit sales growth needed to break through to profitability and cash flow. The proposed equity structure would give shareholders no leverage over management. Evan Spiegel believes that his company’s institutionalized ability to anticipate the tastes of those notoriously fickle young users and deliver innovation will create new monetization levers and keep SNAP the coolest kid in class. Some investors will bet on CEO Evan Spiegel, but we would take a pass. It’s a bit of a cliché. Analysts and pundits like to look at a company and proclaim that it is not really in the business to which everyone connects it, but rather a next-order business that REALLY drives its competitive advantage. Google was not a SEARCH company, but rather, an ADVERTISING company. Amazon was not an E-COMMERCE company, but a LOGISTICS company. Apple was not a DEVICE company, but a LIFESTYLE BRAND. There was a bit of insight in all of it, but ultimately, none of it really captured the whole of any of these bellwethers. Snap decided to play the game on itself. In its S-1, management declared that Snap is a CAMERA company – not a messaging company or a social networking company, but a CAMERA company. This characterization does not suggest that Snap will compete against Nikon, Canon or Apple as a supplier of actual cameras. Instead, it is a gimmicky attempt to highlight the importance that images and video have for Snap’s messaging, social networking and media distribution businesses today and in the future. The Snapchat app opens on the camera, asking the user to take a selfie and begin from there. You can use all manner of filters, animations, and tools to festoon the picture or video for effect, and then you can share it with your friends tagged with a message, confident that no matter how embarrassing, the content will disappear after viewing. You can also take a series of pictures in chronological order and share them as a story – available for 24 hours to anyone who follows you. Celebrities, newsmakers, media and advertisers also participate in posting stories. A select roster of publishing partners post longer form media content to the app, available on the “discover” tab. The app is very popular within a focused demographic of young people with the wherewithal to own a premium smartphone and subscribe to a wireless account with ample high speed data allowances. 158 million people use Snapchat every day, including 68 million in North America (Exhibit 1). These users open the app an average of 18 times a day and spend 25 minutes in total. Advertisers covet this target audience and have responded enthusiastically to Snapchat – the ARPU has more than trebled YoY to $1.04 in the most recent quarter, taking revenues up eight-fold (Exhibit 2). So far, so good. Snap management attributes its success to innovation. Its original idea – picture messages that vanished upon reading – hit a chord with a college age user base eager for a way to share with their friends without leaving evidence that could be embarrassing (or incriminating) later. As the app gained popularity, Snap added tools that let users augment their images and videos, with filters, animations, and other tools – often to humorous effect. Sometimes new effects would be linked to specific geographies (and sponsored by advertisers), or offered for limited times around events, like a movie release (also sponsored). Snap then facilitated users stitching together a series of photos into a story – set in true chronological order rather than the default reverse order on Facebook and Twitter – and allowed the Story posts to stay available for a full day. Snapchat attracted celebrity tastemakers to the app, making their posts available to a broad set of followers. Last year, Snap launched Discover, a media distribution feature limited to 23 specific partners who produce special content formatted for the app (vertical video please!) and share in the advertising revenue generated. Finally, a few months ago, Snap introduced Spectacles – actually, a camera embedded in a pair of sunglasses – which allowed users to take pictures and post them to the app without taking out their phone (Exhibit 3). There are a lot of great ideas in there, and more good ideas that we didn’t mention. Snapchat has been very innovative in continually delighting its core user base and has been rewarded for it. Still, in the Christensen-ian theory of disruptive innovation, Snap has specialized in sustaining innovations that enhance the existing paradigm of mobile messaging, social networking and media distribution, rather than subvert it. Snap is not upsetting the apple cart, it is looking to make better apples (Exhibit 4). In celebrating its institutional excellence at innovation, Snap management describes a world where well accepted success factors like “first-to-scale”, “competitive moats”, and “natural monopolies” are no longer on the menu. Anyone can copy anyone and there are no real barriers in the mobile app world to keep users from quickly migrating to a new service that offers something better. The only way to stay ahead, per Snap, is to run faster than everyone else – that is, to keep innovating around the user experience. Here, Snap believes it has a sustainable institutional advantage in innovation that will help it deliver new services and products that delight its target user base faster than Facebook can copy them. In the tech world, there are no real examples of companies that triumphed over the longer term through an institutionalized capacity for sustaining innovation. Apple built its dominant position with truly disruptive innovation, delivering devastating paradigm shifts first to music labels and then to cell phone makers. Having established first the iPod and then the iPhone, Apple quickly established considerable switching barriers (e.g. proprietary file formats, the App Store, sunk app investment, stranded content, etc.) and then began levering the considerable benefits of scale. Yes, Apple has led the pack on sustaining innovation (e.g. TouchID, Siri, etc.) but “first to scale”, “competitive moats”, and “natural monopolies” were the key to turning disruptive innovation into a competitive juggernaut. Apple’s history provides cautionary look at innovation as well. The MacIntosh offered significant innovations relative to the DOS PC – the graphical user interface and the mouse chief amongst them – and established important beachheads amongst early adopters in the education and design fields. Microsoft, an adept fast follower, delivered the best of the Mac shortly thereafter, and the rest is history. It is entirely possible that Facebook, already adding Snapchat-like functionality to Instagram, will play Windows to Snap’s Mac (Exhibit 5). We see disruption ahead for the Smartphone/App ecosystem, but not from Snap’s newest messaging features. Rather, machine learning based AI will be the agent of sea change. AI will enable virtual assistants to respond to spoken commands, facilitate communications and anticipate user needs. AI will allow augmented reality systems to interpret the real world in detail and interpolate digital content. AI will give content creators new media with which to express themselves and new tools to find an enthusiastic audience. In this, AI could displace the app model for consumer interaction with the internet and enable new platforms to leapfrog popular app-based service providers. All of this is likely to play out over the next 5 years. Snap has some skills in AI. 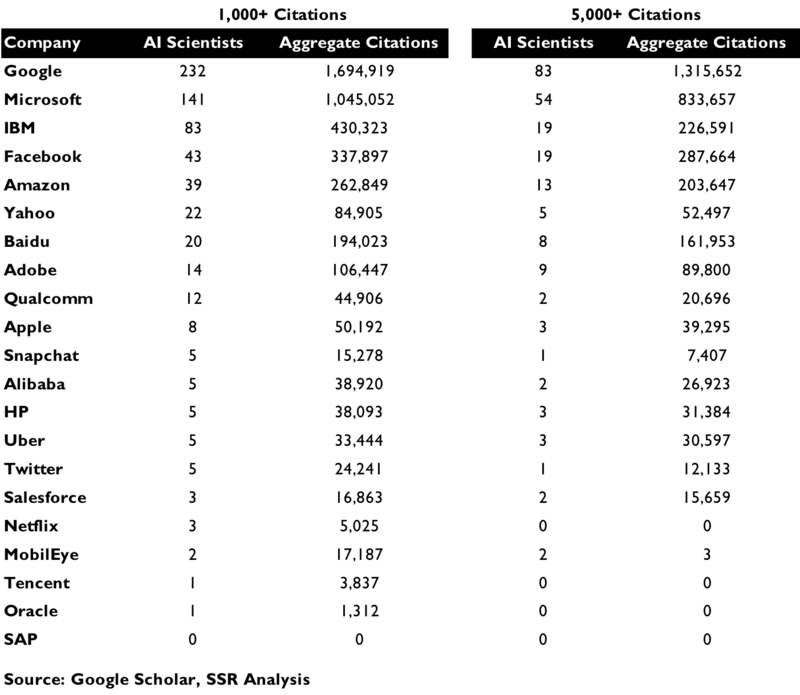 It has 5 scientists with at least 1,000 citations in academic journals for their work in the field, with one of those having surpassed the 5K milestone. This puts them in line with Twitter, but far behind archrival Facebook, which has 43 1K citation scientists and 19 above 5K. Alphabet, whose Assistant technology must be considered a threat, has 232 1K and 83 5K, to go with roughly 2,500 engineers believed to have been trained to competence in the technology (Exhibit 6). Snap also suffers for the ephemeral quality of most of the posts on Snapchat. Data, which could help train deep learning AI systems to anticipate the needs of its users, is lost. Ironically, the biggest threat to the company that touts its competitive advantage in innovation may well be innovation. The most scrutinized data in Snap’s S-1 is probably its user growth. Snap uses daily active users (DAU) rather than the monthly active users (MAU) emphasized by Twitter, perhaps a clever move that will allow improvement in engagement to read as user growth. Still, investors have noted a sharp deceleration in the growth of DAUs over the past 3 quarters. 66% YoY growth in 2Q16 fell to just 48% in 4Q (Exhibit 7). With just 7 quarters of data, this slump is difficult to interpret: Is it approaching saturation? Is it competitive pressure from Facebook’s Instagram, which added me-too features about 6 months ago? Is it some random and insignificant fluctuation? The argument for approaching saturation has some merit. Snap is unapologetic about its focus on young, wealthy users. The Snap app does not run well on lower end smartphones and demands a fast wireless connection for its image-heavy communications. Facebook has adapted its app to accommodate users, prevalent in emerging markets, who do not have iPhones or Galaxy7s and who may be restricted to 3G or even 2G communications. Snap has no such intention. Moreover, Snap skews young. Recent user polls suggest that a major element of its appeal for younger consumers is that, relative to Facebook and Instagram, their parents aren’t on the platform. Snap’s often silly lenses and animations skew juvenile. Its Discover content partners and their exclusive posts intend to appeal specifically to the millennial demographic. About 20% of Snapchat’s DAUs are older than 35 (Exhibit 8). Nearly 80% of Snapchat’s users are American or European. ComScore projects that more than 60% of US smartphone owners between the ages of 13 and 25 are Snapchat users. There are probably limits to how much higher that number can go. If the user growth deceleration is being driven by saturation or competition, the implications could be severe. 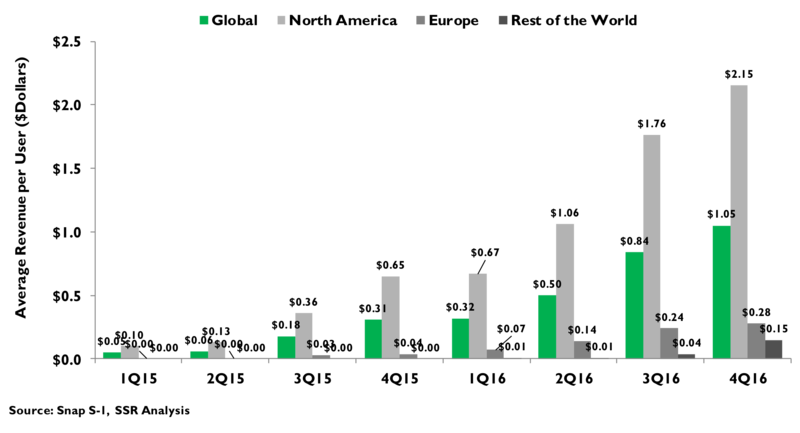 Twitter came into its IPO with a similar story – monetization was expanding rapidly, but user growth was slowing. Quickly, the user growth trajectory became the only important narrative about the company, and eventually, the negative perception of the company effected its ability to sell ads as well. CEO Spiegel will be grilled by investors during his road show as to why this story won’t be true for his company as well. At the time of its IPO, Facebook was already profitable, with gross margins of 77% and operating expenses of 66% of its sales. Unlevered free cashflow was nicely positive, at about 8% of sales, despite $1.2B in capital spending to build out infrastructure (Exhibit 9). Twitter was not profitable in 2013, with 60% gross margins but opex at 155% (Twitter paid a lot of post IPO employee stock bonuses that year). Still, cash flows were nicely positive at about 18% of sales (Exhibit 10). Snap is a very different picture. The cost of revenues are higher than the revenues themselves. Some will be quick to blame Snap’s decision to outsource its infrastructure to Google Cloud Platform and Amazon Web Services rather than build it themselves, but we disagree. Snap is Google’s marquee cloud hosting customer and, reputedly, has advantageous pricing that leaves no profit for Alphabet. 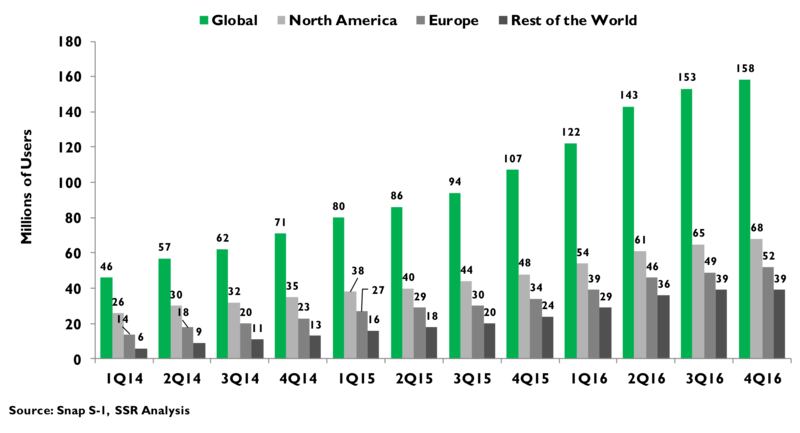 Our work on IaaS (http://www.ssrllc.com/publication/ai-as-a-service-deep-learning-is-fundamental/) suggests that the economies of scale in datacenter operations are dramatic, giving Google large operating cost advantages over all but its closest cloud rivals, Amazon and Microsoft. In this context, it seems unlikely that Snap would be better off building its own mousetrap. Snap has committed some $3B in spending to its hosting partners over the next 5 years, a substantial sum for a company with just $404M in annual revenues today ($346M if you back out revenue sharing owed to content partners). A big factor in this is Snapchat’s video and image heavy application. Every Snapchat session begins with the camera, often applying processing intensive filters and animations to the videos and images uploaded to the cloud. Relative to Twitter, where most posts are 140 text characters or less, with no processing required, Snapchat’s infrastructure requirements are massive. Even with the outsourcing, Snap’s pre-iPO capex, at more than 13% of sales, is higher than Twitter’s at the same stage. Given Snap’s strategy of introducing ever more compelling “camera” experiences to its users, we don’t expect Snap’s processing intensity to wane (Exhibit 11). Snap is also a big spender on operating costs. SG&A is a whopping 72% of sales – Twitter was 46% and Facebook 40% in the year ahead of their IPOs. R&D spending is 45% of sales, more in keeping with Twitter’s 38% but well ahead of Facebook’s 27%. With the intention to out innovate all rivals, we may not see R&D recede much relative to sales, but that SG&A spending is an obvious problem. Altogether, Snap burned $818M in unlevered cashflow for 2016, against $404 in sales ($346M if you back out the revenue sharing payments to content partners). Given contractual hosting commitments and an R&D heavy strategy, it is not clear how the company could get itself to cash positive operations for at least a few years. This could weigh heavily on the stock, particularly if revenue growth appears sluggish for any reason. Snap is rumored to be looking for a $25B valuation, or 72 times 2016 sales after backing out $57.8M in ad revenue paid back to its content partners in revenue sharing agreements. In contrast, Twitter’s $14B IPO valuation was less than 30 times trailing sales, and Facebook’s $104B IPO valuation was less than 25 times its ttm revenues. Comparing the three at the time of issue, Snap has by far the fastest growth rate – off miniscule 2015 sales of just $59M – but its spending levels are growing on a far steeper trajectory as well. If Snap prices according to its aspirations, any whiff of further user growth deterioration would send the shares spiraling. Moreover, the corporate governance structure will leave public shareholders no recourse to influence the direction of the company. Founders Evan Spiegel and Bobby Murphy will control 40% of the equity, but 80% of the votes, giving them freedom to pursue their strategy of winning through innovation as long as they like. Given Facebook’s considerable advantage in resources – including AI talent and data – and its demonstrated talent for responding quickly to its rival’s innovations, we fear the risks greatly outweigh the upside. At least Twitter has a strategic moat to keep the users that they do have. 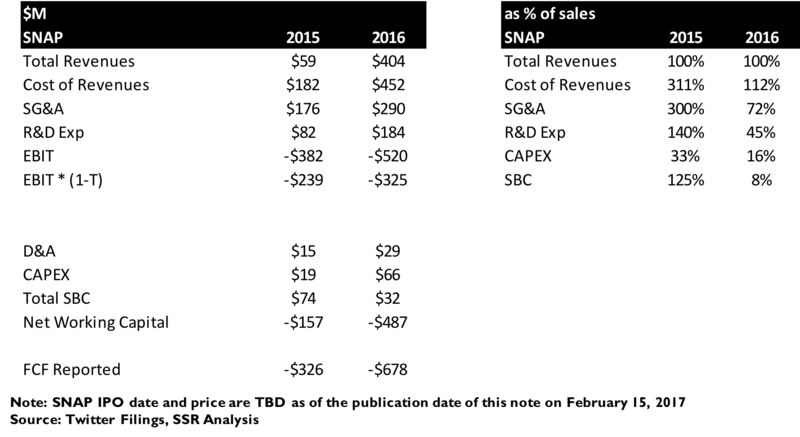 Without more compelling evidence that Snap can reaccelerate its user growth rate, we encourage investors to pass on this IPO.